Great advice! I followed a friend’s advice and took my children with me to the dentist from the time they were born – not to have their teeth checked, just to sit in their stroller and watch me. When they had teeth the dentist let them sit in the chair so he could count their teeth. By the time it was time for a real cleaning they couldn’t wait for their turn. Now 8 and 6 they love going to the dentist – long may it last! 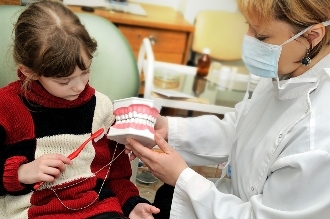 I like your tip to bring your child to the dentist while you have your teeth cleaned. Not only will this allow your child to observe the procedure; it will demonstrate to them that there’s nothing to be afraid of. Children often look up to their parents for cues on how to react to a situation, so acting calm during your dentist appointment can help them be calm during theirs. Thanks for the article. Thanks Hazel…how very right you are! Children take their cues from us when it comes to situations like this. Showing them there’s nothing to be scared of can make all the difference! My daughter loves brush her teeth. And i loves when she ask for more! Nice article! I liked it. Thank you for the feedback. We’re glad you enjoyed the post. Your tips could save some parents some stress, especially the one about preparing the child for someone holding a mirror to their teeth by doing the same beforehand at home. Your other tip about excitedly cleaning the child’s teeth can prepare them to show their great work to the dentist and give them a sense of ownership in the experience, making it fun. Thanks Christina. We are glad you enjoyed the post. Appreciate you stopping by.